← Day On is on again. At Day On our roots dig deep into the Portland startup and tech communities. From our earliest days scheming at CubeSpace, to our Geeks Day On event, and our appearance on 30 Hour Day we’ve been welcomed and made ourselves at home where folks in this community are creating a space to get things done. So it seemed a natural thing for us to sign on for TechfestNW‘s hack day this coming Sunday. Are you a geek who’s looking to do some good? A non-profit in need of some tech help? Well you’re in luck. We’re teaming up with WebVisions at TFNW’s Hack for Social Good. TFNW is the little sister to MusicfestNW, the towering music festival (34,000 attendees), that has taken over the city of Portland for five days each year since 1995. In 2012, we added three days of tech programming, to honor and explore the technology, startups, and design culture that make Portland a digital hub. Curated by Rick Turoczy, founder of PIE, (The Portland Incubator Experiment) and author of tech blog Silicon Florist, our panel-driven event and parties were a perfect complement to MFNW. It’s the reason why Fortune Magazine was good enough to say of us: “Tech may have found its next SXSW.” This year we are back with even bigger plans. 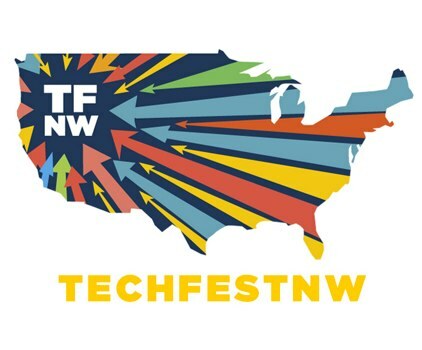 TechFestNW takes over the Oregon Museum of Science and Industry Sept 6-8. In 2013, we will host two dynamic streams ofspeaker programming, an exhibit showcasing the story of crowdfunding, an aerial drone competition, a startup crawl of local up and comers, and even more parties. So come on out, meet the Day On crew and be a part of an amazing community and a phenomenal local event by helping out on the Hack Day this Sunday. If you’re interested in attending TFNW before you join us to do some good, make sure to use the code “bcc” to get $50 off your TFNW wristband.